Today marks the tenth and final installment in the serialization of Dr. Frederick Turner’s APOCALYPSE via Baen Books. What a grand adventure! Next week the ebook will become available followed in mid October by a paperback edition and a museum-quality hard cover. Congratulations Dr. Turner – this poem has been an epic undertaking with amazing results! 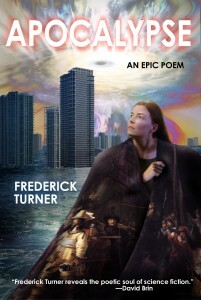 Baen is extraordinarily pleased to have offered Frederick Turner’s wonderful and exciting epic as a weekly serialization through the summer of 2016. The response has been outstanding from readers and it is just plain cool to have the opportunity to publish a genuine epic poem in the great tradition by one of the best poets of our times. We are also pleased to announce that the complete version of Apocalypse will be available in ebook form on September 22 at the Baen Ebooks retail site, Amazon, iTunes, and at other ebook sellers everywhere. “I’ve been getting mail from the most unlikely people saying that Thursday has become a big day for them because of the serial. Others say that they never dreamed that they would be reading poetry with the urgent desire to find out what happens next. And that was what I’ve wanted poetry to be like all along. The concept and the format were just right. ← It’s a New York Times Bestseller!